As we approach calving season it is important to assess your cows Body Condition Score (BCS). Cows calving in optimal BCS (5 or 6) have shown to have numerous benefits. One of the largest benefits of good body condition at calving is subsequent reproductive performance. Cows in good body condition at calving are more likely to breed back in a defined calving season. In the last two years, environmental factors, such as heat and drought, have hurt pregnancy rates and elongated calving seasons. Many cows have fallen behind or completely out of a breeding season. Upcoming years show promise for cow calf producers, making sure cows are in good condition to breed is a must for any cattlemen. Good conditioned cows also have less problems calving and provide better colostrum to their newborn calves. Thin cows are weak and are more apt to "give-up" during calving. They have less energy reserve to tap into during the demands of parturition. Thin cows will pass on less immunoglobins in colostrum and thus, fail to provide the greatest immunity to newborns. Colostrum is a calves first chance at a healthy life. Don't allow thin cows to ruin calf health and performance while being harder to get bred. A saying that I truly believe in is "You can't starve a profit out of a cow." 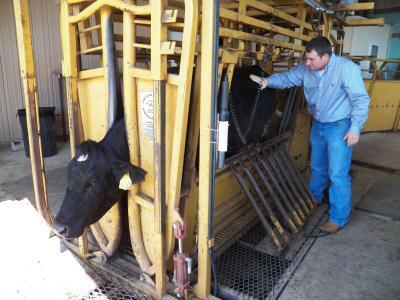 It is no secret that cows in good body condition will result in fewer headaches. Less calving problems, healthier calves, and quicker breeding cows....Sounds like a good Christmas present to me.